June 25th 2014. 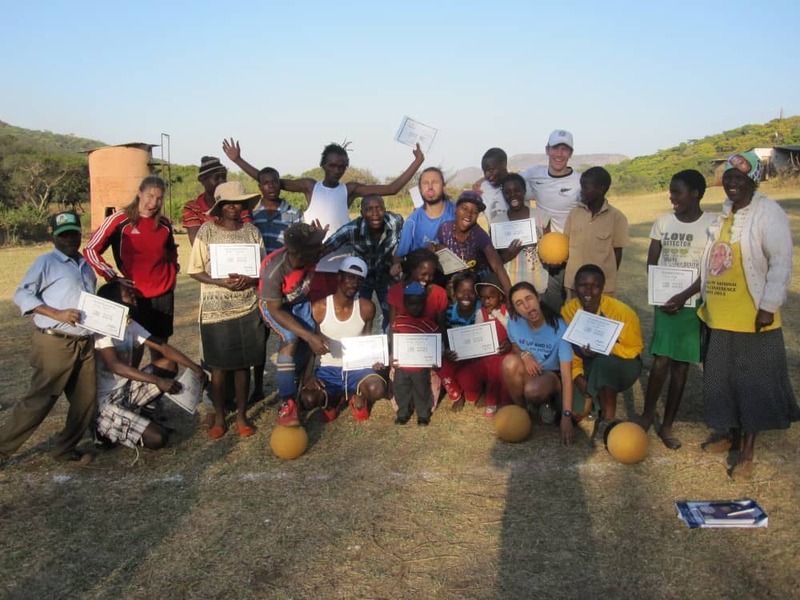 Coaches Across Continents volunteer Layla Joudeh blogs on her experiences in Zimbabwe. I tried one more time to muster up internet connection in the Johannesburg airport, but my thirty minutes of free wifi had run out. The rushed tapping on my phone while wifi time runs out is a feeling to which I have become accustomed. However, no quick typing or Facebook message would affect the next leg of my 30 hour journey from South Carolina to Zimbabwe. The CAC coaches were excitedly (well…I can only hope) waiting for me in the Harare airport. In the coming week, we’d be partnering with Zimbabwe’s own Bulldogs Sports Development Trust to coach program participants in soccer for positive social impact. As I walked out of the Harare airport, I was excited, nervous, a little hungry, and ready for the adventure to come. But first- I had to send my family a text message to let them know I had arrived safely. Unsurprisingly my phone wasn’t connecting to any wifi, so I had to borrow another coach’s phone. The tale of being out of touch with my life back at home had begun. During the next week I found myself, for the most part, out of contact with friends and family. I sent the occasional email or text, but my wifi connection would be lost before I could finish a conversation. My family wasn’t around for constant words of encouragement when I needed them or for an update after I coached my first game- Mia Hamm for Health and Wellness, which is when I quickly found out coaching players that weren’t fluent in English would take a lot of body language, enthusiasm, and examples. My friends weren’t around to poke fun at my poor juggling skills or fear of Zimbabwe’s snakes (which I fortunately have not encountered). But by losing the constant presence of the people I felt most comfortable around, I was forced to take a look at all the people I had around me for support, laughs, and conversation. The CAC coaches, Markus, Julie, and Charlie, were new friends, but friends nonetheless. I found that connecting off the field helped our connection on the field. Whether it was bonding over the massive spider we found in our bedroom or trying to guess how late our ride would be, I was slowly finding comfort in the coaches with which I was working. I feel that the more we worked together, the closer we would become (as long as we continue to peacefully trade off on who has to sit in the middle seat during our long, bumpy car rides). The participants in the Bindura program also served as a way to connect with the people in my working environment.On Monday and Tuesday of the program, participants would trickle in to training- some for the first time and some came back as returners to the CAC program. On Wednesday we began to see the foundational group that would continue training with us until Friday. They were invested in the messages we were teaching and brought energy to the games. The participants responses to the games were encouraging and made me think about how we could better improve games in the future. We were helping them develop as coaches just as much as they were helping us develop as coaches. I truly felt a connection with the group on our last day of training. We were playing Tim Howard for Conflict Resolution. Participants split themselves into three groups of five and lined up behind each other. Using different passing techniques, the participants had to get the ball from point a to point b in their line. The participants were excited when they won, became frustrated when they lost, and we even had a few cheaters. 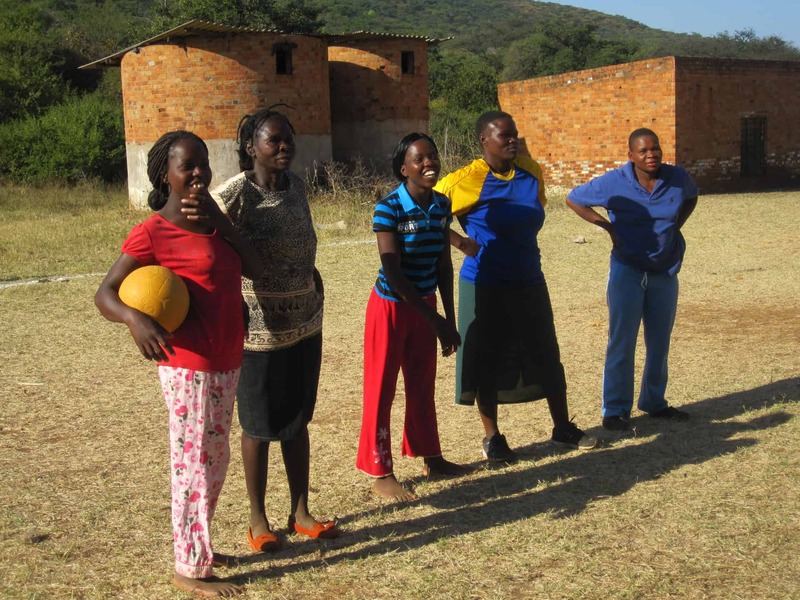 I watched as Gertrude- a netball and soccer coach- led her group to several victories. Gertrude was content on the soccer field and smiled widely when her group did well or something funny happened on the pitch. I looked forward to training each day partly because of Gertrude. Her interest in the program provided me hope that she would use our curriculum for her sports teams. For this past week in rural Bindura, Gertrude and the rest of the participants encouraged me with their willingness to learn and gratitude for us and the game of soccer. Sometimes the program didn’t always go as planned. We couldn’t email or text participants to remind them about training. There was no Facebook event announcing our arrival. We were dependent on Bulldogs, our partner program, to organize training. In rural Bindura, word of mouth is the main method of communication, which meant sometimes word didn’t get around as effectively as we needed it to. Participants were usually late to training or didn’t attend every day. The flexibility of the CAC program allowed us to cater the curriculum to the number of participants for any day or the amount of time we actually had once everyone arrived. Without access to virtual communication with our participants, we had to find other ways to connect with our participants. We had small conversations after training, worked to make games enjoyable so they wouldn’t forget about training, and tailored our curriculum to the community’s needs so they understood that we were invested in its positive growth. Our interactions with the participants had to be intentional in order for us to form a connection with them. Away from the soccer field, we stayed in a home on the outskirts of Harare. “Mother” as she was called was, funny enough, a mother of three children. She was working hard to build up a house and future for herself and kids. Because her house was still in construction and we were in a more rural part of Harare, amenities that contributed to my daily routine were not available. At the home, I had no access to internet, no running hot water, no heat, and often times no electricity. However, I did have the other CAC coaches, “Mother” and her family, a warm bucket of water to bathe in, a warm bed to sleep in, and a host mom who loved to cook us the tastiest meals. My daily routine of oatmeal for breakfast, leftovers for lunch, and a nice Syrian meal prepared by my grandmother for dinner were exchanged for beans, rice, eggs, and avocado for breakfast, a peanut butter sandwich for lunch, and sadza, pork, and cabbage for dinner. Before I continue on, I believe sadza requires its own blog post because it’s so amazing. If you are to look at a portion of sadza, you’d see something similar to mashed potatoes with the texture and consistency of play dough (finally a play dough that little kids can eat). Sadza is a maize based, staple food product of many southern African countries. To eat sadza, you make a small ball of it in the palm of your hands, create a small dent in the middle of the ball, and use this ball to grab whatever food is on your plate. Hence, sadza is used in place of utensils. My hands and food have definitely connected this past week. Because I was not distracted by texting, emails, or keeping everyone at home updated, I experienced the culture of a family in Zimbabwe uninterrupted. By the end of the week I felt at home in “Mother’s” house. When I first arrived in Harare, I was excited, nervous, and hungry. One week later, I am still excited and nervous but less hungry thanks to a delicious barbecue with some people at our current lodge. Zimbabwe knows how to make some good sausages. Our friends at the lodge know how to cook them. Anyway back to the important things- I am still excited and nervous about the upcoming weeks of working with CAC. 6 more weeks, 4 more programs, and 2 more countries stand between me and a big hug from my mom. In the meantime, I will continue to look for wifi and for the most part come up empty handed. But I will also continue to grow in my relationships with my fellow coaches, to find joy in working with program participants, and to gain knowledge about different cultures, and I know I will not come up empty handed…except when I run out of sadza. I’m slowly learning that temporarily losing connection with the people and routines to which I’m accustomed will allow me to connect with the people, places, and experiences around me in unexpected ways. I think if I keep it up, I’ll learn a thing or two. So let the excitement and nerves continue because I am ready for the adventure to continue. This is awesome. I’m happy that you get to have this experience (and also a bit jealous!). It sounds like an amazing program and I hope you’re able to soak up the rest of the experience. Being disconnected like that sounds scary but it’s also something that I really want to try sometime. Anyways, great blog, I’m excited to hear more about your trip! Sounds like a blast, and for good cause, too. Like FOP, but on another continent. I hope the rest of it goes well!